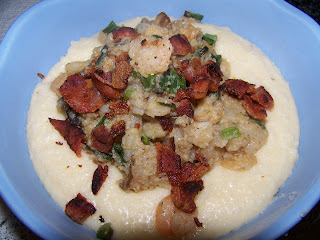 I'm still on my grits kick (and I'm currently needing to put hot sauce on everything) and this recipe modified from myrecipes.com couldn't be passed up. We have a restaurant near us that makes amazing shrimp and grits. This recipe is quite different but still amazing. It may be my new comfort food. Sprinkle shrimp with pepper and salt; dredge in cornstarch. Serve shrimp mixture over hot cheese grits. Top with crumbled bacon. Enjoy!